A delicious treat from a fan! In a medium bowl, mix together the yeast, warm water, and 2 tablespoons of sugar and allow to dissolve. Set aside. In a large bowl, add the flour and margarine, using your fingertips, pinch together the margarine and flour until combined. Add the salt, remaining sugar, and eggs, mixing well together with your hands. Remove to a lightly floured work surface and knead until dough is soft. Remove dough to a large bowl, cover with a clean kitchen towel and allow to rise at room temperature for 2 hours. Remove the dough to a lightly floured work surface and using a rolling pin, roll dough out to 1/2-inch thickness. Using the mouth of glass, cut out rounds in the dough and cover rounds with a clean kitchen towel, allowing to rise for 30 minutes. Fill a large Dutch oven with 2-3 inches of vegetable oil and preheat to 360ºF. Line a plate with paper towels. Gently place the carrot in the preheated oil and keep in the oil while frying. This will keep the oil fresh while frying donuts. Frying in batches, cook the donuts until puffed and golden brown, about 3-4 minutes on each side. Remove donuts to the prepared plate. Fill a squeeze bottle with strawberry jelly, and make a hole in the in the side of the donut with the tip of the squeeze bottle, and fill with strawberry jelly. Repeat with remaining donuts. Dust the tops of the donuts with confectioner’s sugar and serve. Tip: Get creative! 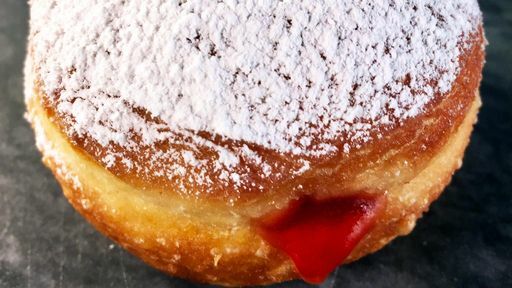 Fill donuts with your favorite flavored jam or chocolate pastry cream!